for some financial help, so has to have a little better event and to promote Dahanu (Taluka) more towards Sustainable Progressive Development. After seeing our proposal they got interested and to have a wider reach, the Discover Dahanu Festival became ‘The Chikoo Festival’. Dahanu, being a small coastal town, not many are aware of its history, its natural topography, its tribal interiors with rich culture and abundance of primary art & craft, and more so of the many reasons for being called as the ‘Lungs of Mumbai’. The social mosaic of the region is dotted with agriculturists, horticulturists, floriculturists, artisans, potters, basket weavers, jewelry die-makers, salt manufacturers, balloon manufactures, toddy tappers and fisher folks apart from primitive activities like boat repairing and net making. Well equipped with hotels, resorts, organic farms, sightseeing, hands-on village experiences, games and nature trails, a very good educational tourism opportunity can be generated which will help not only the existing hospitality industry but also provide new avenues of income generation to the orchard owners, local shops and establishments as well as the local tribal population, the Warlis, who constitute 66% of the total population of the area. The Chikoo Festival will provide a platform to showcase all these. Dahanu taluka is today at crossroads – ecologically, socially, culturally; surrounded by the rapidly advancing industrial and commercial metros of Mumbai, Tarapur and Vapi. With over 50% land under fruit orchards, forests & mangroves, this region has a lot to offer through agrotourism. 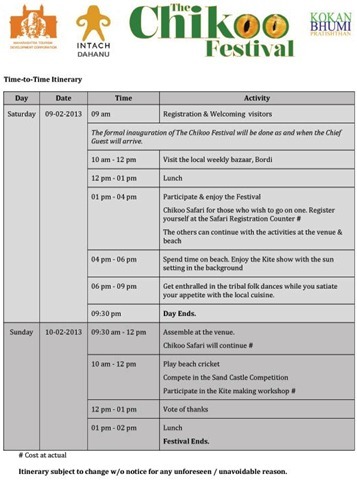 Through the Chikoo Festival, we intend to showcase what this region has to offer its visitors. 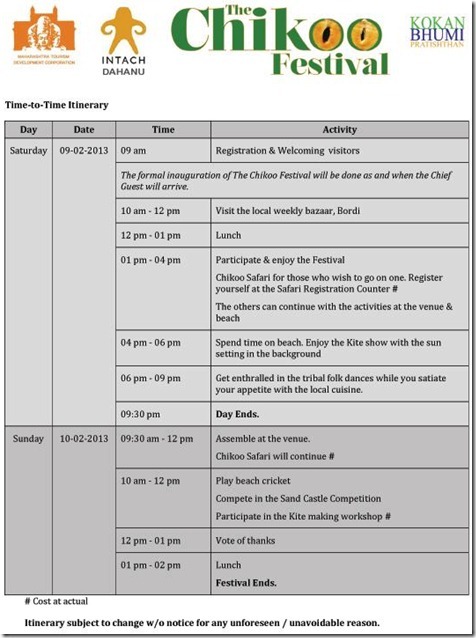 The basic aim of the Chikoo Festival is to Entertain, Educate and Sensitize its visitors. Our mission is to create opportunities for individuals and communities to celebrate, share and sustain the arts and the rich cultural traditions of the local area thereby creating alternative sources of income and sustainability. The events will range from organizing a small fun-fair wherein stalls will be set-up to showcase different offerings; tribal art and craft, agricultural products, fresh fruits & their products, photo exhibition on the region, to outdoor attractions like Kite making and Kite flying, Nature Stroll, Games and Adventure, workshop related to agrotourism, tribal village visits, local market visits, Bon fire with Finger foods at the beach, etc.